The Royal Scottish National Orchestra (RSNO) has now collaborated with Richard Kaufman for the fourth time. Kaufman is a conductor but also a personal friend of famous composer John Williams. Their relationship started when Kaufman played the violin in the orchestra that Williams was conducting. This evening’s program was a nice selection of John Williams pieces and some other Williams-related tunes. I had very high hopes for the first piece played: “Summon the Heroes” is, to date, my favorite Williams piece. It does not come from a movie but is a theme written for the 1996 Olympic Games. The piece is very heavy on brass instruments. To give this a special effect, three brass players were standing in the top section of the venue playing their parts. I could not see exactly which instruments they were playing, but I saw at least one trumpet. I was really hoping to get all emotional while it was played, but unfortunately, that did not happen. Perhaps it is because the two different brass sections–the one on the stage and one up above–were a bit out of sync. Aside from conducting, Kaufman was also the host of the night. He spoke between almost every piece, telling small anecdotes about John Williams and Steven Spielberg. Next on the program was “Hymn to the Fallen” from Saving Private Ryan. It was beautifully played by the orchestra, but to be honest, that piece needs a choir for the finishing touch. After “Jim’s New Life” from Empire of the Sun, it was time for music from Lawrence of Arabia. This piece is not from John Williams. It was in the program because the movie is one of Steven Spielberg’s favorites. The next piece, “The People’s House” from Lincoln, was followed by “The Duel” from The Adventures of Tintin, which I noticed is not a track title from the commercial soundtrack album. 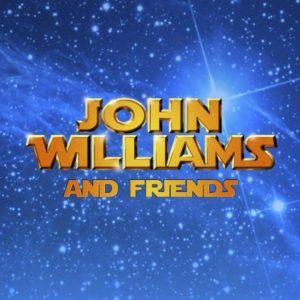 Kaufman explained why: this track was taken directly from John Williams’ private library and has not been published elsewhere. Afterwards, Kaufman gave a compliment to the violins because it is a very difficult piece for them to play. The theme from Always was played next, another piece from John Williams’ private library. In the anecdote for the next piece, Kaufman told the audience a quote by Steven Spielberg about Williams. He said: “John Williams is E.T.” With this statement hanging in the air, he turned around and started conducting “The Flying Theme” from E.T. This version was extremely pleasant to listen to. I still had goosebumps when the intermission started afterward. When we went back to our seats, we could hear the tuba player doing some last minute practicing for his solo for Jaws. To us, that was funny because it was the second concert in a row that we heard a tuba player practicing the solo from Jaws. When the piece was done, Kaufman asked the tuba player to stand in acknowledgment of his fantastic performance. The next two pieces were from Indiana Smith. . . no wait he is called Indiana Jones… from the movie Raiders of the Lost Ark. 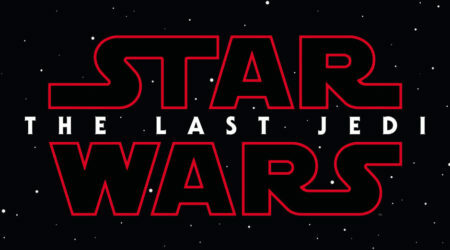 Apparently, the name was altered just before they started filming the movie. The first piece was the beautiful “Marion’s Theme” and the second one was of course “Raiders March”. Next up was a piece from the movie Catch Me If You Can, with a very nice jazzy saxophone solo. Before John Williams started composing he used to play piano on film music cues. He played the music from Peter Gunn composed by Henry Mancini for example. The orchestra played a great version of this. You could see the smiles on the faces of the musicians while playing it. The biggest smile was on the drummer’s face because he had a chance to go totally wild. We heard awesome guitar, trombone, and saxophone solos, then the three instruments together, and then the full orchestra kicked in again for a solid ending. To me, this was the highlight of the evening. Steven Spielberg made a multimedia presentation called The Unfinished Journey with music composed by John Williams. Williams later crafted a concert work from said music called The American Journey. The orchestra played “Flight and Technology,” the last movement of that work. It was a beautiful piece with a spectacular finale. 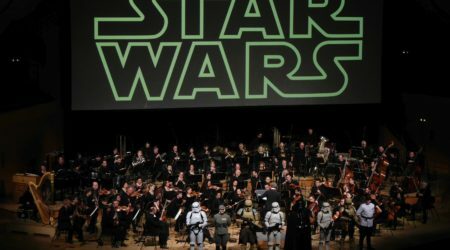 You simply cannot have a concert about John Williams without Star Wars and, agreeing with this sentiment, the orchestra ended with a solid rendition of “Throne Room and End Title”. It was not really the end because we then enjoyed “Imperial March” from The Empire Strikes Back as well as an encore. Overall it was a very enjoyable concert. Of course, music from one of the best composers in film music helps a lot. 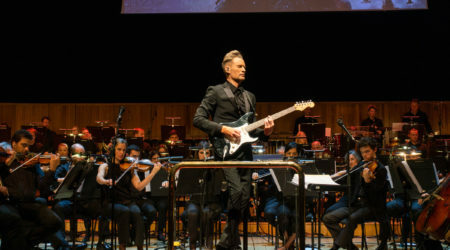 The start of the concert was a bit dodgy– I noticed quite a few technical errors here and there in the pieces, but as the concert progressed during the evening it got better and better and the errors made way for some very beautiful and solid performances. I can see why John Williams admires this orchestra. Also, Richard Kaufman as the host was a very nice treat; he had some very interesting things to tell.